Iran will sign a contract with Russia next week to buy four S-300 surface-to-air missile systems, the Iranian defence minister said on Tuesday, bringing Tehran closer to acquiring an advanced air defence capability. Russian state arms producer Almaz-Antey in June said it would supply Iran with a modernised version of the S-300, among the world's most capable air defence systems, once a commercial agreement was reached. "The text of the contract is ready and our friends will go to Russia next week to sign the contract," Defence Minister Hossein Dehghan was quoted as saying by the Fars news agency. 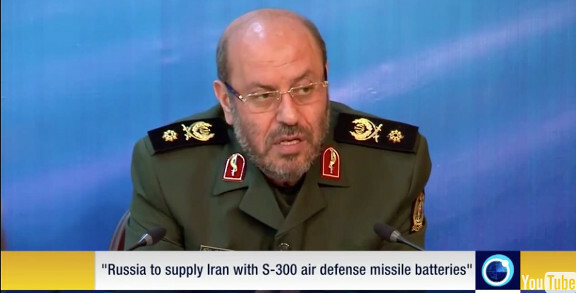 [O]n the delivery of the Russia-made S-300 surface-to-air missile defense system, [Iranian Defense Minister Dehghan} said that Tehran had asked for 3 battalions of S-300, while a fourth system has recently been added to the order. Despite a ban on arms shipments to Iran under international sanctions, Russia appears willing to proceed with the sale of advanced S-300 surface-to-air missiles to the country -- in a development triggering objections from the Obama administration. Russia, along with the U.S. and others, was a party to the recently struck Iran nuclear agreement, which keeps the arms embargo in place for five more years. A State Department official told Fox News this specific S-300 missile system is not technically prohibited under United Nations sanctions or the nuclear deal. But the department does not want the sale to proceed. “We certainly object to it,” department spokesman John Kirby told reporters. COMMENTARY: Iranian sources are reporting the S-300 issue was a prime topic of discussion during Foreign Minister Zarif's trip to Moscow earlier this week. Delivery of such a weapon system would provide the Rouhani administration with a tangible advance in the field of defense, consequential to its successful nuclear negotiations. It may even be recognized for its domestic political value by Iranian proponents of JCPOA, as serving to undercut or possibly placate critics of JCPOA among Iran's military and conservative establishment. Should there actually be movement for this long-stalled arms transaction, it will be interesting to see which type of system is actually delivered to Iran. Iran will "not necessarily" order the S-300VM Antey-2500 air defence system, Russia's Interfax-AVN news agency cited a "high-ranking source in military-technological co-operation" as saying on 23JUN15. There was widespread presumption among Russian analysts that Iran would have to accept the S-300VM because the S-300PMU-1 that it originally ordered is no longer produced by Almaz-Antey. S-300VM systems are currently being made for Egypt, which is a close ally of Saudi Arabia, Iran's main regional rival, so Tehran might consider it to have been compromised and consequently a less attractive option than systems from the very different S-300PMU series. The Russian business newspaper Kommersant reported on 22 June that, after "some hesitation", Iran had decided to take the S-300VM. It added that the only other option for Iran was the S-400 Triumph system, but that would be significantly more expensive and would take longer to deliver as Almaz-Antey has a backlog of orders from the Russian armed forces and China. This assertion appeared to be echoed by the senior source cited by Interfax-AVN on 23 June. "It would be practically impossible and economically inexpedient to supply systems in the form and under the conditions set out in the old contract," he said. "This is because, first and foremost, series production of these systems stopped a long time ago." However, he added that the systems Iran would ultimately order "will not necessarily be Antey-2500 … other options are also being discussed". The source raised the possibility that Iran could get a more advanced version of the S-300PMU series than the one it originally ordered, saying Russia could modernise systems that have been retired by the Russian armed forces. "They would not be new systems, but ones that have been used by troops for some time [which would have to undergo] serious modernisation," he said. So what will happen to the highly publicized Bavar 373 system. Official statements from Iran can be likened to a game of ping pong. As long as Agha Zadehs get their commission who care what Iran gets. The Russians might sell the system to Iran for an extremely high price.But unfortunately the number of units sold will be ineffective for any major attack on nuclear facilities. And no Iran can't copy such a advanced system.It is akin to giving a dog a dry bone to keep the animal happy. you start with a development projekt, you stop it if get a better offer. Bavar 373 is just one of the thousands examples of the regime's empty bluffs and propaganda. It is the true example of their so called "مدیریت جهادی". It is in nature similar to the "نرمش قهرمانانه" which they demonstrated in nuclear negotiations. Logically it is true, When you are not able to manufacture and deliver similar system to S-300 domestically through your "Jihadi Management", you have to demonstrate "Heroic Bending" around the nuclear negotiation table. Considering the time and amount of money spent since 1989 (more than a quarter of century), it is too much for too little results. They have not even managed to produce a reliable jet engine to use as a platform for their new concept air craft designs. So far they just demonstrate air craft mock ups in different air shows without any hardware to back up the claim. What happened to Shafagh, to Qaher 313 to Homa and Saba helicopters? In what stage we are standing now in the process of designing/manufacturing 150 seat national air craft? What was the problem behind loosing all those An-140 air crafts? and what has been done to correct it? Regarding the missiles, in my opinion the previous drill conducted using US air craft carrier mock up was a failure. They conducted that drill a head of the important nuclear negotiations as a gesture of demonstrating their power but it had an opposite results. Some cruise missiles detonated before hitting the target as a result of the shock wave generated by the impact of the previously launched missiles. Some other lost the target as a result of the smoke over and around the target. In addition there was no video or image of the Persian Gulf Missiles hitting the target. All these indicates that in spite all their war cries both cruse and ballistic missiles have serious problems in finding the target at the moment of impact. After the drill in an interview on the TV they tried to justify the matter but it made the case worse. Another problem was`the impact power of the missiles. Impact punch was not high enough to deliver a knock out blow to a heavy vessel. In my opinion even a dozen of those missiles is not enough to sink or even disable a carrier for a long time. The same analogy applies to Soumar. It is not a big deal to reverse engineer a 1970 USSR cruise missile in 21 century for a country with 75 m population and remember none of these weapons are battle tested. Last but not least is the production capacity. How much capable is our manufacturing industry to deliver a mass quantity of the products in the case of war. Certainly by lining up few old lath machine in a corner of a work shop you can not mass produce elements of a war machine. So lets be realistic and not fall into illusions. I'm afraid I disagree. Even the Pentagon's declassified and public briefings started to acknowledge Iran's capability in designing increasingly more advanced ballistic and anti-ship cruise missiles are a fact to be reckoned with since the early 2010s and have sanctionned several Chinese and Russian companies in that regard, too. The stories you are refering to go back to before 2006-2007 were Iran was still experimenting with its early production variants of Noor missiles (C-802 derivations) but even then one single hit from an export version of this missile was able to critically cripple and put the modern Isareli INS Hanis frigate out lf combat along with four sailors dead and many wounded. The warhead didn't explode and hit the bow of the ship this time but the damage was still consequent. Since then both SRBMs and further evolutions of the C-802s (notably the Qader) have come forth and again have been deemed quite serious by American defense circles and Leon Panetta himself. Al-Jazeera and Jane's reported repeated use by Syria of Iran' prized Fateh-110 and dubbed it as a certified metric precision missile able to target building-sized targets with reliable accurary since their 3rd generation. Iran and its 75 million population as you put it had put an enormous amount of ressources and time to develop a credible deterrent through the production of the most diverse ballistic arsnenal of the middle east , and the mere fact that its main regional rivals such as the KSA and more specifically Israel haven't moved against it beyond mere regular PR threats can come as an indicaton on how seriously they take that deterrent. Old times were early versions of Shahab missiles were barely able as city busters with 4 km precision is long gone. Now of course we cannot talk about 5 or 10m precision so long as Iran hans't sent an array of military grade GPS and observation satellites into space also for TERCOM mapping into space, but we certaibly cannot disregard their advances in this particular field over the years with such dubious examples as and truncated facts put together in a hasty way. Inded there have been many failures in Iran's missile program, just as there were with every country freshly embarking on such ambitious endeavor on top of existing sanctions on related technology and machine tools procurement for their R&D and emerging from a long and disastrous war from an enemy enjoying internarional backing. That does not mean Iran hasn't made signifucant progress over the years and reached a point were external powers consider their arsenal as an element in negotiations when weighing military options against it . When you say "excellent negotiated" what in particular you are referring to? - The fact that we will be dismantling all the centrifuges in Fordo? - That we are not allowed to make research and development on plutonium reprocessing technology? - That we are not allowed to make research and development on enhanced centrifuges or test our already existed enhanced centrifuges for 10 years? - That after so much effort we will dismantle our heavy water reactor and deprive ourselves of generating power using raw uranium and render our heavy water production plant useless? -That for 25 years IAEA will have full access to our uranium mines? -That we neutralize 10 tons of 20% enriched uranium or ship it out to Russia? -That we secretly signed an agreement with IAEA allowing them to interrogate our nuclear scientists as a result of which putting their lives in jeopardy? -That in no circumstance we should have more than 300 kg of 3.25% enriched uranium? This in practice means almost no enrichment activity at all. Countries like Brasil as a signatory of NPT are entitled to do all these activities without any restrictions or penalties. Countries like India, Pakistan and Israel which are not signatory of nuclear Non-Proliferation treaty produce nuclear weapon and get a way without penalty. Then the question is how come we are being treated differently? Why? Because people deciding for Iran and its people want to swim against the current in the world. By doing so they generate a pretext based on which they suppress people and rule them. Off course we do not have freedom inside but after accepting all these conditions, can you claim that we are an independent country? or all our rhetoric is for domestic purpose of fulling people inside and when push comes to the shove we are ready to drink a cup of poison or demonstrate heroic flexibility. In this circumstance poor people who pay ultimate price under sanctions and suffered most. With all respect you did not address my concerns and answer my questions above. -What has happened to Shafagh, Qaher, Homa, Saba, an-140 and national 150 seat air craft? -Why some of the cruise and all the ballistic missiles used in recent drill missed their target? -How many new saeghe fighter has been produced since 2007? -Why we have not thus far mastered producing a jet engine for our fighters? -Why we are still using analog avionics in our planes? Why we have not managed to install fly by wire systems in our air crafts by now. Why don' we have up dated radars installed in our planes by now. -Have you ever seen any domestically produced fighters demonstrating stunts like those you see in air shows? No, because pilot is afraid of loosing a wing upon doing such an action instead of flying straight. The answer to the above question is: Because country is not using its full potential and resources in achieving these goals mainly as a result of conspiracy/corruption caused by personal and gang interests, lack of knowledge, lack of management, lack of appropriate study and plan, allocation of the available resources and funds to irrelevant tasks and sectors, not holding people accountable for their conducts, lack of observatory and controlling systems, etc. Unfortunately as long as this system is in place we can not hope better results and few good managers can not rectify the whole system. Iranian Imperial air force had in its inventory some of the most sophisticated aircrafts of its era , namely F-14 Tomcat and its Phoenix weapon system .However the current Iranian regime hasn't shown any real interest in modern fighter/bomber jets .The American supplied airplanes in Iranian air force today are way past their useful life cycle. The newer ex-Iraqi Mirage F-1 , Su-24 and Mig-29s sort of fell into their lap . Any reasons why the Iranian air fore hasn't shown any interest in Su-27/34/35 or mig-31 ? -National 150 seat in progress but shouldn't be pursued from economical reason.. it is a learning platform only. - Those avionics that have been replicated or designed are in digital domain. Now days no one can afford Analog design. Although you have points but it is better just to mention your points rather than talking and giving examples of something you have no information or clue about. Miss management exists and so does corruption. - We used to have Golden Crown acro jet team before revolution doing all those stunts using F-5 fighter which saeghe has copied from, therefore your justification of 8G and 9G class is nonsense. A fighter incapable of doing those maneuvers is not a fighter. There are not too many pilot out there to endure 8Gs even with g-suit any way. - I did not understand what you meant by "Although you have points but it is better just to mention your points rather than talking and giving examples of something you have no information or clue about". I was inside that industry at management level and know exactly what is going on and what I am talking about. Yes, AN-140 is not adaptable to the climate of Iran, but this fact is not the first thing that a decision maker should think about before spending all those money and establishing its manufacturing line? Therefore you are confirming that what I mentioned about the system was all true. - Sometimes it does not matter if you have a clue or not, observable facts on the ground speaks for itself. It has and talks are underway. They wouldn't allow any purchase till now. Even now they have to wait 5 years to get it. As Dehghan said they are in talks for joint production which in turn can neutralize current 5 year sanctions on offensive weapons as it doesn't cover manufactured in Iran. You had points on mismanagement and corruption and no clue on Fighter jets and avionics. The Golden crown jets wouldn't pull more than 8 or 9 G the airframe is not designed for such G's. The airplane they have built is not inferior on these aspects. Anyway do a research on sustainable G''s and you will figure it out. Anyway you neither have proof that Saegheh is incapable of 8G nor anyone else here. So why talk about it. Just stick to the facts no need to speculate. It is more than obvious that mismanagement exists. It existed in every era of Iranian history. I am not expecting them to do extra ordinary maneuvers with Saeghe the same maneuvers as those of Golden Crown team is satisfactory. Any fighter plane after production is tested by a test pilot making all those maneuvers to find any malfunction in the systems. We have never seen such a demonstrations so far. If it was any they would definitely show it for propaganda purpose. Up on unveiling second generation Saeghe they did not show inside the cabins while the reporter was sitting inside the cockpit. This cause a legitimate speculation that no MFDs installed. I will not speculate about fly by wire because for sure it is none existed. Like any other Iranian I want to see big achievements for my country and seeing it shine in the world, then I can keep my head up and say "I am an Iranian". I have full confidence on sharp, intelligent and capable Iranian scientists, engineers and students. If there was a correct system in place involving all qualified people and all available national resources and potentials in the framework of correct organization where efficiency and productivity was in place then the outcome would be much different from what they have achieved today.